Hi beautiful readers! So, serious question. 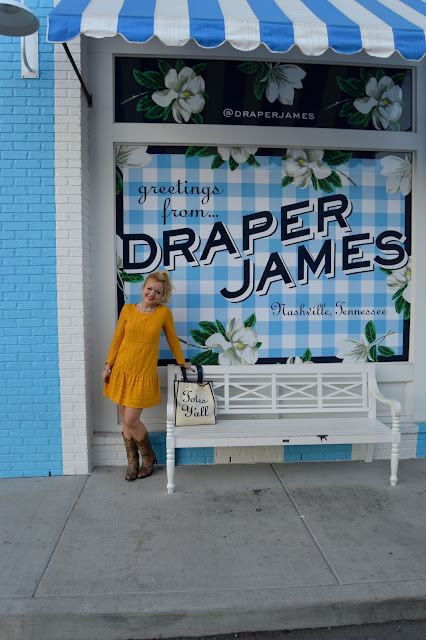 Have y'all checked out my favorite blonde Reese Witherspoon's absolutely a-dor-able line Draper James? 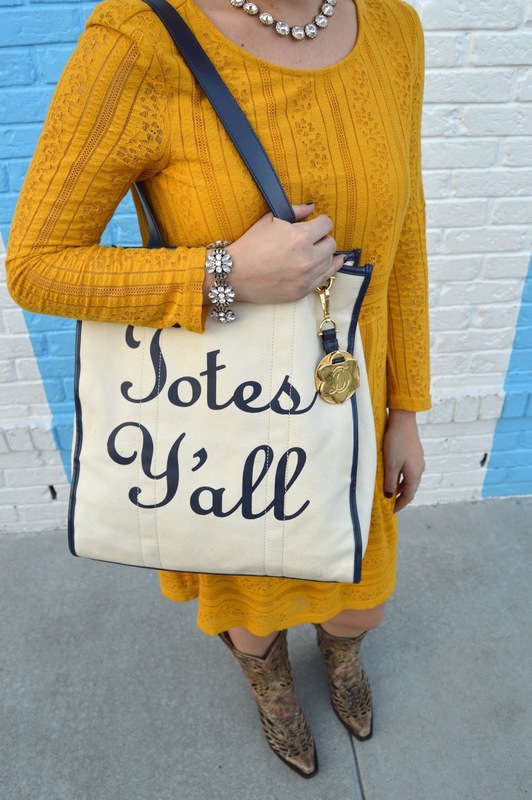 It is seriously everything a southern girly girl's dreams are made of. 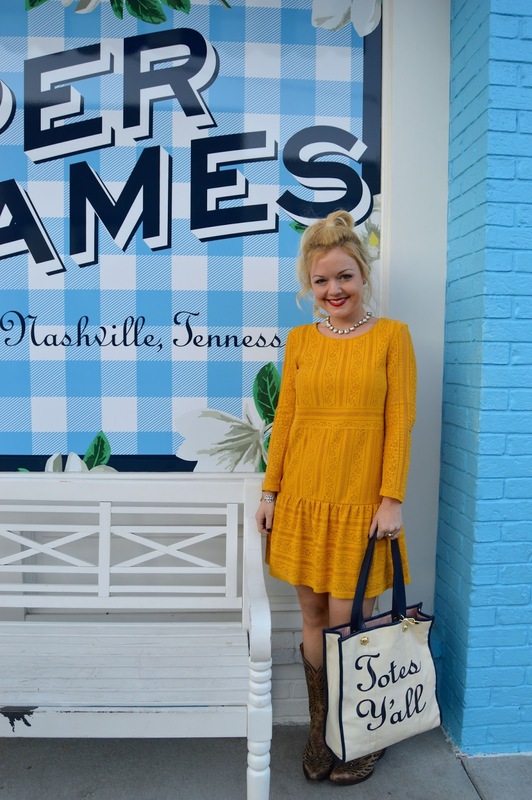 With hints of yellows, blues, reds, and greens, the colors she uses for the clothing are dreamy yet classic. 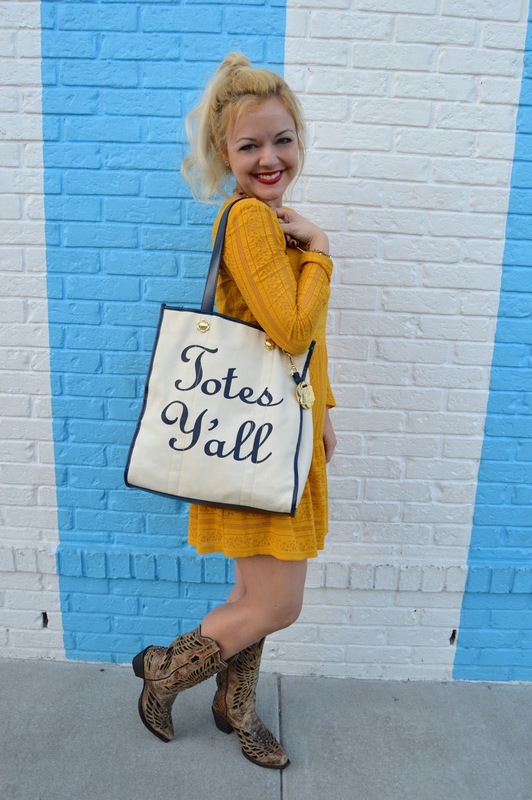 She also has super adorable home accents sprinkled with various Southern-isms (I think I need these! Maybe I can convince my fiancé we totally need to create a wedding registry here! haha!). 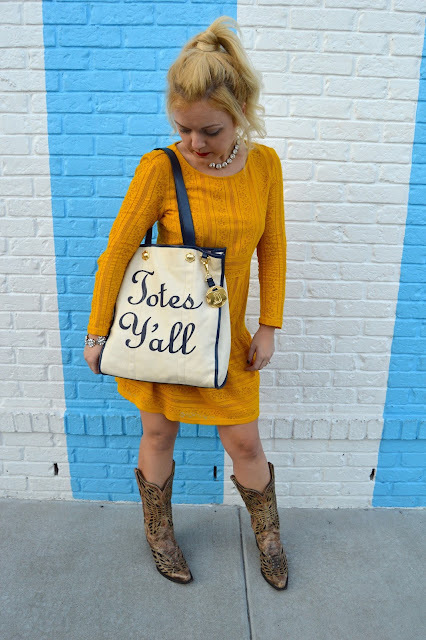 But, I have to say, that my absolute FAVORITE piece in her line is the Totes Y'all handbag I'm wearing in the pictures above! I love it for so many reasons but mainly because 1) Totes is one of my favorite things to say 2) Y'all is my second favorite thing to say due to my Southern roots 3) Totes Y'all is a combination of 2 of my favorite things to say EVER- and, finally... 4) this bag is SO roomy for all of my junk...err...necessities ;). It goes with countless outfits and also comes in other styles (here and here). The Draper James flagship store in Nashville just celebrated its 1-year anniversary last week, so naturally I had to stop by and take some #ootd pictures when I was in Nashville for school last week (maybe one of these days when I go I will just so happen to get to meet Reese--aka Elle Woods---herself!). The dress I'm wearing above is not Draper James but it is one of my favorites I bought from H&M. Long-sleeve dresses for fall are a closet-staple because they can be paired with boots to dress them down or heels to instantly dress them up. 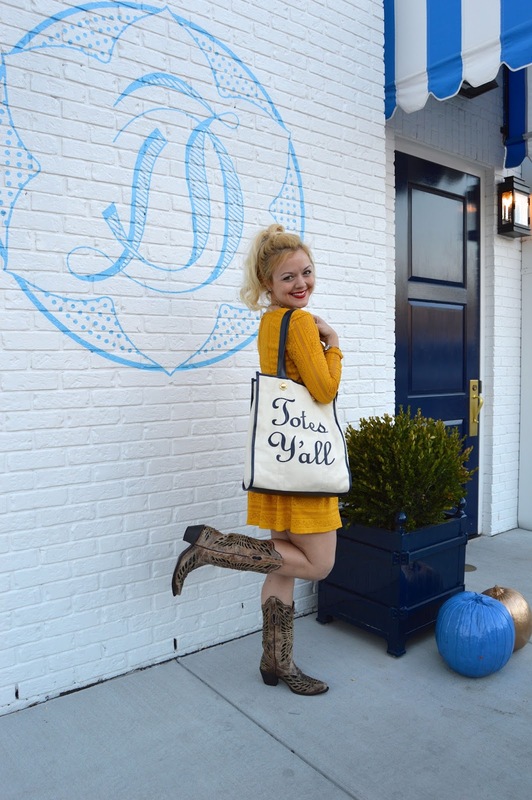 And, speaking of boots...who doesn't go to Nashville without their cowgirl/cowboy boots?! 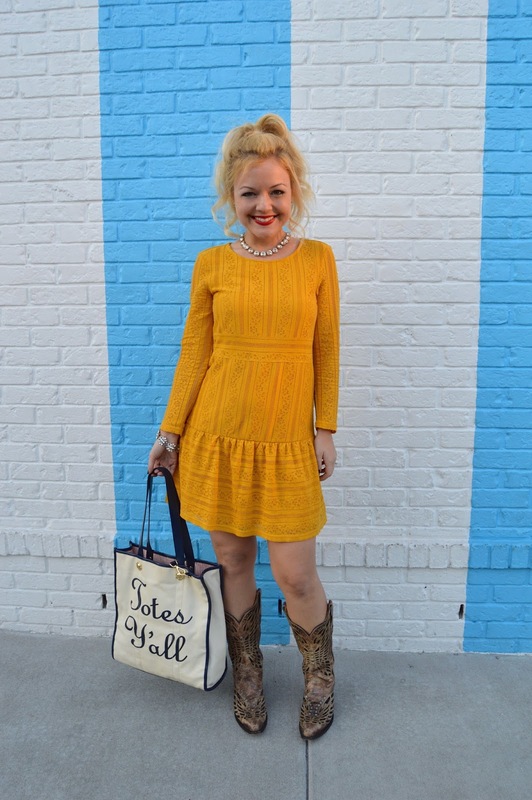 Seriously though, these Corral boots are my obsession when it comes to cowgirl boots. I bought them for my bestie's wedding's last year (all the bridesmaids wore cowgirl boots-too cute! ), and I have worn them countless times since. Corral makes some of THE cutest boots that are unique (with rhinestones, etching, beautiful designs etc) that they are truly like wearing a pair of artwork :). 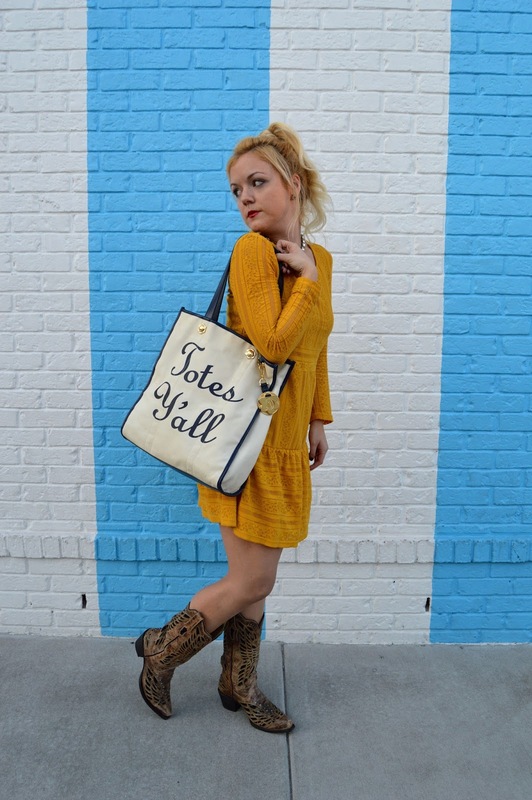 Check out some of the Draper James items on my wish-list: Sugar Darlin' Flippa Bag, Tailgate Sweater, Sweetie Pie Tee, and Ryman Jacket. Thanks so much for reading dolls! Be sure to leave me a comment & tell me what your favorite item from her line is!